Not all luxury vacations are created equal. It's a bold statement, but we’d go so far to say that TradeWinds creates dream luxury vacations unlike anything you've ever experienced. We've handpicked fabulous all-inclusive vacations for you to choose from. Each of these all-inclusive vacations offer something different. From luxury yacht charters sailing stunning waters and unique land-based gastronomic experiences to our exclusive 'Best of Both Worlds' land and sea experiences, we'll help you choose the right luxury vacation. All you have to do is choose your perfect getaway, leave the office behind and indulge in the ultimate jet-set lifestyle. The Caribbean is known to have some of the finest diving sites in the world, and it’s no secret that Guadeloupe offers a wonderful underwater world that’s waiting to be discovered. Home to the famous Cousteau Marine Reserve, protected bays provide keen divers of all abilities the chance to experience a perfect diving and snorkeling paradise. Snorkel around volcanos and reefs teeming with fish, discover la Baleine – a protruding reef in the shape of a whale and listen out for whale song – a moment that you’ll never forget. With so many diving highlights, including some ‘secret sites’ not on the itinerary, you’ll find it hard to choose a favorite! The perfect vacation if you want to experience and explore the world-class diving sites that surrounds the beautiful Caribbean island paradise of Guadeloupe! Uncover the magic of the Mediterranean and discover the amazing mythology of Greece and the stunning Ionian islands. Picturesque fishing villages, beautiful natural bays and breathtaking scenery are just some of the wonderful that Greece has to offer. Step back in time and meander through old towns, sample a glass or two of the delicious local Ouzo, or enjoy practising the language with your new local friends! Swim or snorkel in crystal clear waters and feel the warm breeze while you cruise from island to island. The perfect vacation if you want an active week to truly discover the beauty of Greece, enjoy the amazing Mediterranean culture and cruise around the awe-inspiring Ionian islands! Breathtakingly beaches, incredible turquoise waters and picture perfect atolls, ideal for sailing, swimming, and snorkeling are just some of the delights that await you in the British Virgin Islands. With over 60 islands in its archipelago, the British Virgin Islands provide a wealth of fun for those looking for excitement and adventure. As well as being famous for diving and sailing, discover wonderful hidden treasures, such as ‘Bubbly Pool’ – nature’s very own Jacuzzi, the Baths and North Sound, known as a playground for water sports including hobie cats and windsurfing. Visit local hangout Foxy’s and ‘Willy Ts’ floating bar for some well-known Caribbean hospitality. And don’t forget to try the famous Pusser’s rum! The perfect vacation if you want to experience a week of fun in the Caribbean sun. Make the British Virgin Islands the perfect base for all your sailing adventures! Known as the ‘Crossroads to the Caribbean’, this charming dual island nation is so good, they named it twice! Boasting a tropical climate, enchanting sandy beaches and exciting dive sites St Martin is definitely the island for activity seekers. Slip on your sneakers and hike up to the mountain top for spectacular views of neighboring St Barths. Or slip into stunning azure waters and snorkel with an array of marine life at the famous Creole Rock or Tintamarres’ Tug. Explore the coastline on a sea kayak and enjoy the sights and sounds of true Caribbean living. The perfect vacation if you’re looking for fun in the sun, exciting adventures and a true taste of the Caribbean! Discover a brand-new vacation AQUA·TERRA experience in the Jewel of the Caribbean and enjoy the best of both worlds at sea and on land. Go barefoot and feel the warm Caribbean surf and soft, white sand beneath your feet and enjoy a week of fun in the sun – TradeWinds style! Cruise around the stunning Tobago Cays Marine Park where you can swim and snorkel in an inspiring protected marine environment famous for its diving sites and coral gardens. On shore, indulge in friendly, Caribbean hospitality as you explore this captivating little island. Hike up to the quaint old church and take in the stunning views of Mayreau or head over to Saltwhistle Bay and get ‘Liming’ with the friendly locals. The perfect vacation if you want an exciting week of fun adventures at sea and on land at our brand-new AQUA·TERRA resort on the island of Mayreau! It’s no secret that the Caribbean is known to have some of the best dive sites in the world, and Antigua is no exception. Get ready to experience an aquatic adventure like no other. Dive into crystal clear waters and open your eyes to incredible marine habitat, home to endangered Hawksbill turtles, fish of every size and species, including moray eels, burrfish, and rays, to name a few! 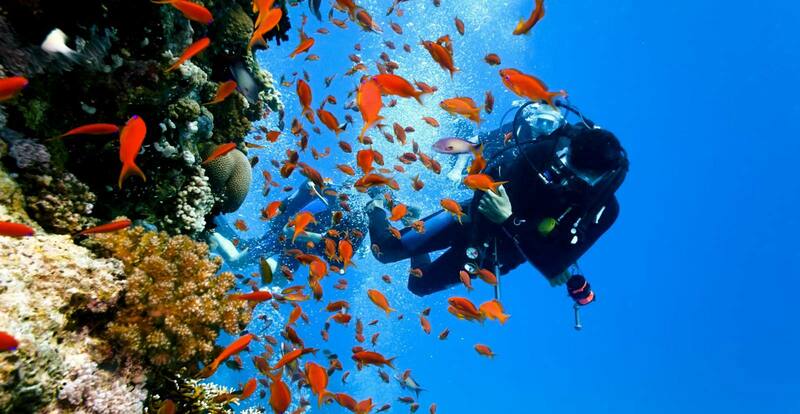 With a maximum depth of 120ft Sunken Rock is known as one of the best dive sites in the Caribbean. Antigua offers an abundance of exciting wrecks and colorful reefs and provides an ideal playground for those who want to explore what this charming island has to offer beneath the surface. The perfect vacation to dive in and discover some of the finest reefs and wrecks in the Caribbean. Amazing marine life, coral reefs, and canyons are waiting to be explored in Antigua’s mesmerizing underwater playground!